Motivation plays a key role in the learning of skills, because the performer has set himself/herself goals to achieve and that is his/her motivation to succeed. Motivation is also a key essential in a learners preference and selection of activities. A03 Learning Theories In this assessment objective I will investigate the theories that have been proposed to learning. Motivation plays a key role in the learning of skills, because the performer has set himself/herself goals to achieve and that is his/her motivation to succeed. Motivation is also a key essential in a learner's preference and selection of activities. "internal state or condition that activates behaviour and gives it direction" There are two types of motivation intrinsic and extrinsic, below I am going to explain the both of them: Intrinsic: intrinsic motivation "occurs when an individual participates in an activity for its own sake. 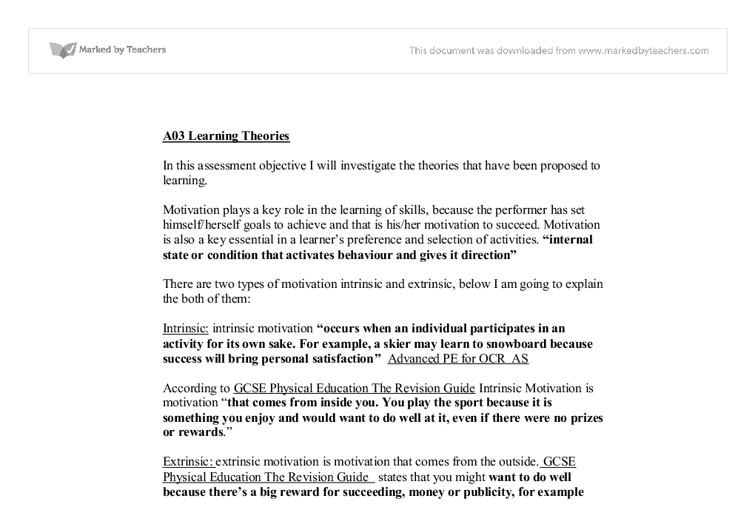 For example, a skier may learn to snowboard because success will bring personal satisfaction" Advanced PE for OCR AS According to GCSE Physical Education The Revision Guide Intrinsic Motivation is motivation "that comes from inside you. You play the sport because it is something you enjoy and would want to do well at it, even if there were no prizes or rewards." Extrinsic: extrinsic motivation is motivation that comes from the outside. GCSE Physical Education The Revision Guide states that you might want to do well because there's a big reward for succeeding, money or publicity, for example ???????????? ...read more. After several 'trials' Pavlov rang the bell without presenting the food and found that the dogs salivated in the same way as if food was being presented. ????????????????????????????????????????????????????????????????????????????????????????????????????????????????????????????????????????????????????????????????????? ????????????????????????????????????? ??????????????????????????????????????????????????????????? ??????????????????????????????????????????????????????????????????????????????????????????????????????????????????????????????????? ??????????????????????????????????????????????????????????????????????????????????????????????????????????? ???????????????????????????????????????????????????????????????????????????????????????????????????????????????????????????????????? ???????????????????????????????????????????????????????????????????????????????????????????????????????? What Is Operant Conditioning? Operant conditioning is a method of learning that occurs through rewards and punishments for behaviour. Through operant conditioning, an association is made between behaviour and a consequence for that behaviour. "Active behaviour that operates upon the environment to generate consequences" B.F Skinner (1953). In other words, Skinner's theory explained how we gain the range of learned behaviours we show every day. Examples of Operant Conditioning Examples of operant conditioning can be found all around us at work at home at training etc. An example would be a race at training and being praised or rewarded. In these examples, the promise or possibility of rewards causes an increase in behaviour, but operant conditioning can also be used to decrease behaviour. The use of punishment can be used to decrease or prevent unwanted behaviours. For example, a pupil may be told they will lose break privileges if they talk out of turn in class. ...read more. Necessary conditions for effective modelling: 1. Attention - various factors increase or decrease the amount of attention paid. Includes distinctiveness, affective valence, prevalence, complexity, functional value. One's characteristics (e.g. sensory capacities, arousal level, perceptual set, past reinforcement) affect attention. 2. Retention - remembering what you paid attention to. Includes symbolic coding, mental images, cognitive organization, symbolic rehearsal, motor rehearsal 3. Reproduction - reproducing the image. Including physical capabilities, and self-observation of reproduction. 4. Motivation - having a good reason to imitate. Includes motives such as� past (i.e. traditional behaviourism), promised (imagined incentives) and vicarious (seeing and recalling the reinforced model) Bandura believed in "reciprocal determinism", that is, the world and a person's behaviour cause each other, while behaviourism essentially states that one's environment causes one's behaviour, Bandura, who was studying adolescent aggression, found this too simplistic, and so in addition he suggested that behaviour causes environment as well. Later, Bandura soon considered personality as an interaction between three components: the environment, behaviour, and one's psychological processes (one's ability to entertain images in minds and language). "Social learning theory has sometimes been called a bridge between behaviourist and cognitive learning theories because it encompasses attention, memory, and motivation. The theory is related to Vygotsky's Social Development Theory and Lave's Situated Learning, which also emphasize the importance of social learning." 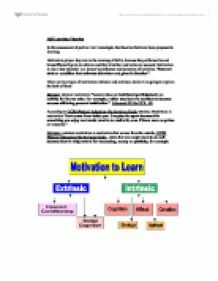 http://www.learning-theories.com/social-learning-theory-bandura.html ...read more. therefore making it hard for the opponent to predict where the ball could be served to. Having his feet with the right foot behind allows quick movement after the serve has been taken allowing him to be ready to return the ball when the serve has been returned. Motivation 10/10. Ryan is a very well motivated player and others can get motivated by just watching him play, or playing along side him. Ryan was very motivated for the game as he was starting and new that he had to perform to help the team to win and get the 3 points. items on this scale are thought to reflect the influence of whatever transient situational factors exist at the time of testing. Validity: Correlations are presented in the manual between this scale and other measures of trait-anxiety: the Taylor Manifest Anxiety Scale, the IPAT Anxiety Scale, and the Multiple Affect Adjective Check List. when I am in the gym I will do research on all the machines and equipments so I no thoroughly how to use them. Also if I am training by myself I will carry a mobile phone with me to make sure that in any event of an accident I will be able to contact someone for help. * Talent identification * Provide feedback Prior to any form of testing or exercise, a performer must undertake a health and safety assessment that is known as a Physical Activity Readiness Questionnaire (PARQ) (see Appendix 5). The tests itself should follow a set concept and structured assessment so that the tests are reliable, specific, valid and objective. I have an intensive 2 and a quarter hour class at the Birmingham Royal Ballet. My classes during the rest of the week are on Monday (Modern Dancing), Thursday and Saturday (Ballet). * I attend badminton club after school every Friday, exercising for 1 hour. In a game situation agility ids essential to defeat the opponent whilst remaining in control of the ball. * Speed- is the ability to move as fast as possible. In hockey it is important players are fast so they can respond to a stimulus, make a calculated decision as to what to do net.